18/08/18 – Isaac and Meme have been adopted! Hooray! Say hi to Isaac (brindle boy on the left) and Meme (black lady to the right)! 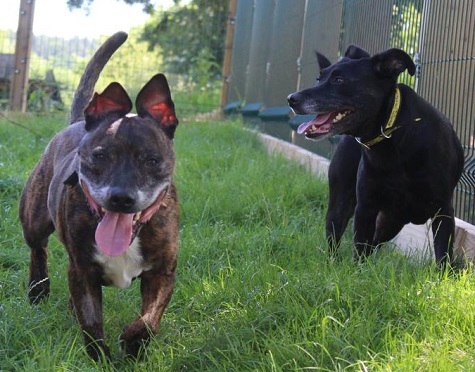 These two Staffy crosses are the very best of friends and they love to play and cuddle together. Isaac is the oldie at age 7, while Meme is an honorary oldie at just 5. 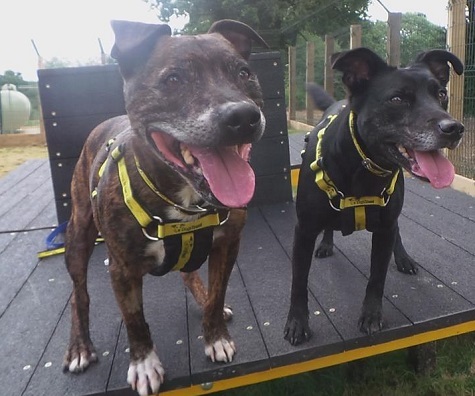 This adorable couple are current residents of Dogs Trust Newbury while they search for someone who has a heart and home big enough for two. Isaac has a huge smile and a charming personality. He loves running about and playing in the compounds, rolling in the grass and creating his own crop circles in the tall grass. 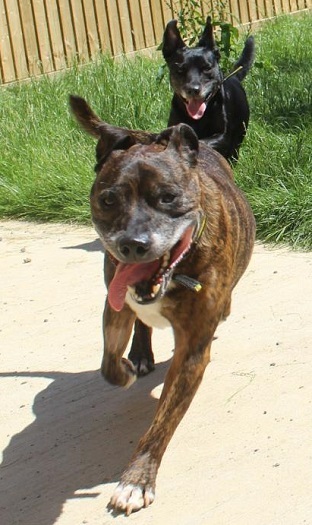 He also loves running around with bestie Meme and his carers. 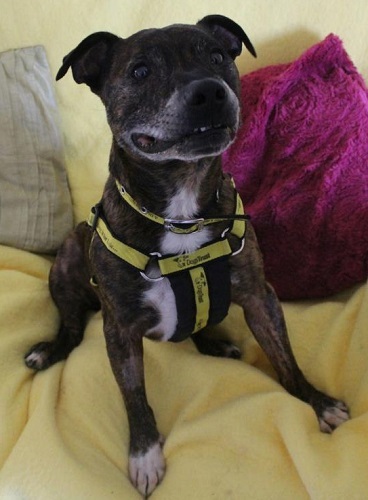 He is a happy, loving soul who will bring a lot of joy to any home. Isaac has some allergies which will need to be monitored in his new home. Meme can be a little worried and shy at first, but once you know her, she turns into a real cuddle-bug! 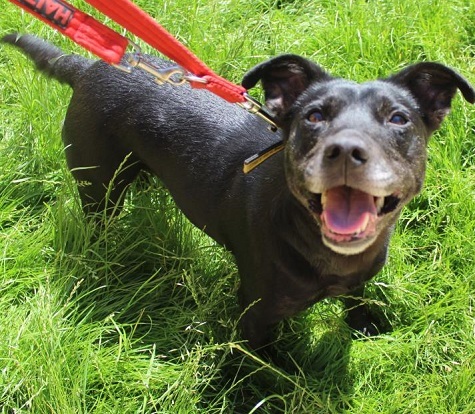 She enjoys being outside and sunbathing and, of course, playing games with Isaac and being with her carers. She is a real sweetheart, who just needs time and lots of love to blossom and thrive. These two are looking for a fairly active home where they can get out for nice long walks and some play time in the fields. That being said, they are equally happy just to snooze and sunbathe their days away. Both have some basic training, but they would love to learn more if they know treats will be involved! Isaac and Meme would love owners who can be around to give them plenty of cuddles and to play with them. New owners should work with them at getting comfortable and confident enough to be left for longer periods of time. Have a look at this lovely video of Isaac and Meme! As you watch, take note of the constantly wagging tails. How adorable is that? These two sweeties could share their home with children over the age of 11 and they have previously lived with a cat, so could probably do so again, given the cat’s temperament! If one dog is not enough to love, you need two! And these lovely dogs are happy to fill that special place in your heart that’s there just for them. Please mention that you saw Isaac and Meme on the Oldies Club website.